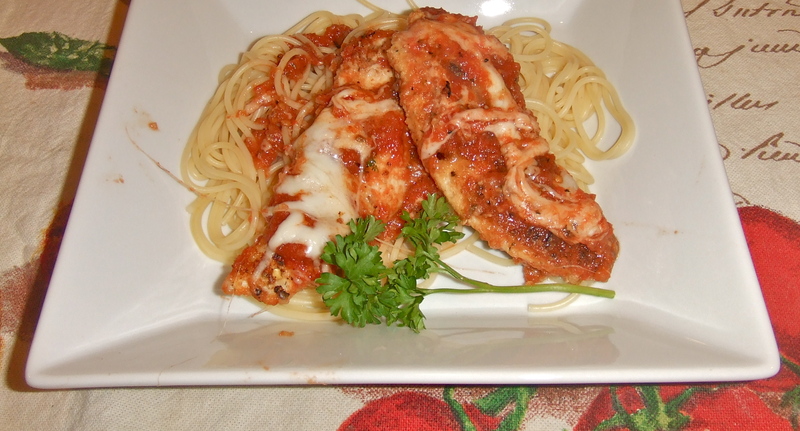 I never have been one to order chicken parmesan at an Italian restaurant, but I happen to really like this meal! The idea of a chicken tender, instead of a whole chicken breast, for some reason makes this meal a lot more appealing to me. Plus, this is actually pretty healthy, which is something I generally don’t associate with chicken parmesan from restaurants. In fact, I like this version so much that it has been one of my “go to” dinners for a couple years. It’s pretty simple to make, and since I’ve had the hang of it for a while now, I decided to re-complicate it for myself and make my own sauce . The sauce making process wasn’t very difficult, but making it at the same time as the chicken made for a lot of dirty pots and pans, as well as tomato splatters all over the kitchen. So as a note to myself, the next time I make this I’m going to make the sauce ahead of time (or remember to thaw out the leftover sauce I have frozen). I figure that will make this a really easy weeknight meal. ***Before I decided to complicate this recipe by making my own sauce, I used bottled tomato-basil or sundried tomato sauce and add a few tablespoons of balsamic vinegar to it. This worked fine, and made this recipe really easy. 1. Combine the bread crumbs, grated parmesan, basil, parsley, and salt and pepper in a shallow dish. 2. Lightly beat the egg white in a small bowl. 3. Dip each chicken tender into egg white and then into the breadcrumb mixture, so each is coated. 4. Heat the oil or butter in a large skillet over medium high heat. At the same time preheat the broiler in the oven. 5. Add the coated chicken tenders to the skillet and cook for 3-4 minutes on each side. 6. Warm up the tomato sauce in the microwave (especially if it’s been in the fridge because it’s not in the oven that long to get hot), and then pour over the chicken in the skillet. 8. Place the skillet in the oven, and broil for 2-3 minutes to melt cheese. Serve alone or over pasta (I like angel hair or thin spaghetti). Also works great with broccoli or a salad. I’m not really sure what the definition of marinara is… and since I changed this recipe a lot, I’m not even sure if you can still call it a marinara. But any who, this is a pretty basic pasta sauce and it worked great with this chicken! 2 – 28 oz cans whole tomatoes, drained but juices reserved. 1. Heat oil in a large, deep skillet over medium high heat. 2. Add the chopped onion and cook 5-7 minutes, until lightly browned. 3. Add garlic, oregano, crushed red pepper to the onion and stir for 30 seconds. 4. Add tomatoes to pan, but reserve 4-5 tomatoes (these will be added later to give extra texture to the sauce). 5. Cook tomato mixture for 10-15 minutes, allowing it to thicken. 6. Add the balsamic vinegar and stir for about 1 minute. 7. Add the reserved tomato juice to the pan, stir, and simmer for 10 minutes. 8. Add sugar, salt and pepper to the sauce. 9. Transfer the mixture to a food processor and add the reserved tomatoes. 10. Pulse 15-20 times until almost smooth. – Can be refrigerated for 5 days or frozen in an airtight container for 2-3 months. This entry was posted on February 11, 2011 by Spice Is Nice. It was filed under Easy Weeknight Dinners, Main Dish . This looks great and easy too – if I use bottled sauce 🙂 I feel the same way about the tenders – even if I eat two of them – they are just more appealing. Made the pizza dough last night – it’s in the freezer! You are inspiring me Jacqueline. I am going to get my Mom to subscribe to your food blog…keep up the wonderful ideas!